The final frontier of style! 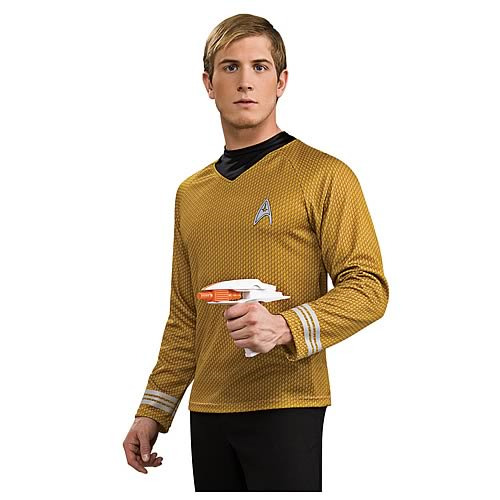 Add this to your Captain Kirk costume. Just like the uniform shirt worn in the Star Trek movie. It's a great way to show how you feel about Star Trek! It's time to beam up one of these! You've seen the sauve, yet rugged Captain Kirk in a yellow Starfleet uniform for ages. Now order one specially sized for you! This Deluxe Gold Shirt includes shirt and dickey, and features a Starfleet embroidered emblem! Based on designs from the J.J. Abrams Star Trek movie, this hyper-realistic uniform shirt is a great way to show how you feel about the good commander, the Enterprise crew, the blockbuster movie, and the entire Star Trek experience! Available in S, M, L, and XL sizes. Rubies costume sizes differ slightly from standard clothing. Click here for a size comparison chart in order to select the best possible fit.